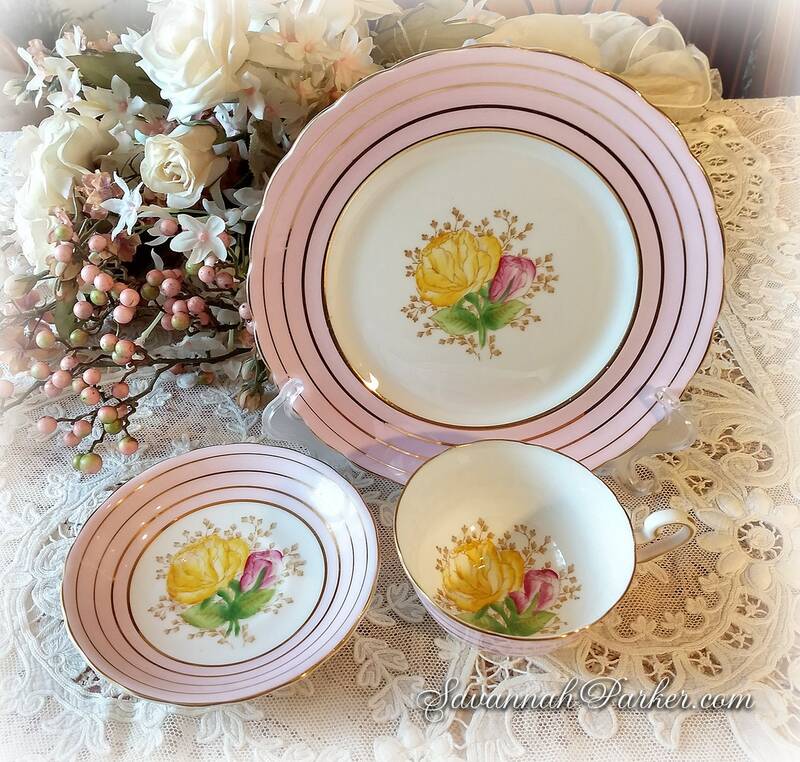 Exquisite vintage, hard-to-find handpainted Victoria C & E English bone china cup, saucer and luncheon/dessert plate 3-pc trio that features wide banding of luscious light pink with gold gilding, and handpainted floral centers on all three pieces. 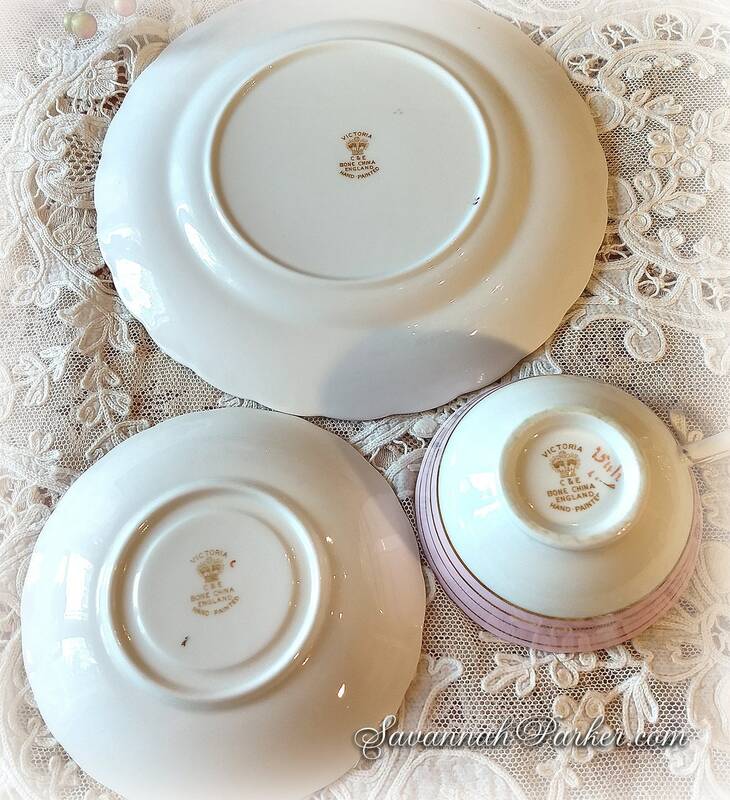 3-pc trios are much more rare and difficult to find than a cup and saucer set--have spent quite a bit of time in my china-collecting journeys in search of them. 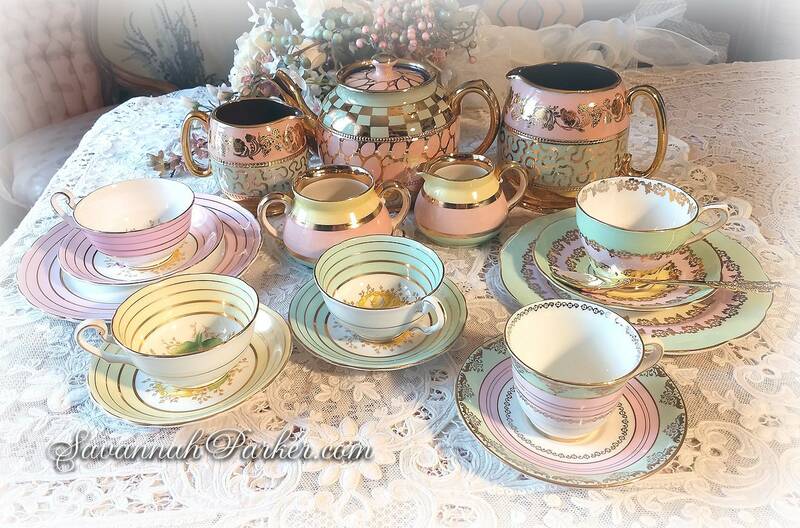 I've now opened my new "vintage china department" in my shop and this is part of my first group of listings---a mouthwatering collection of ice-cream-pastel colored vintage china and ceramic pieces that go beautifully together---be sure to please view the last photo here for the other wonderful items I have listed elsewhere. 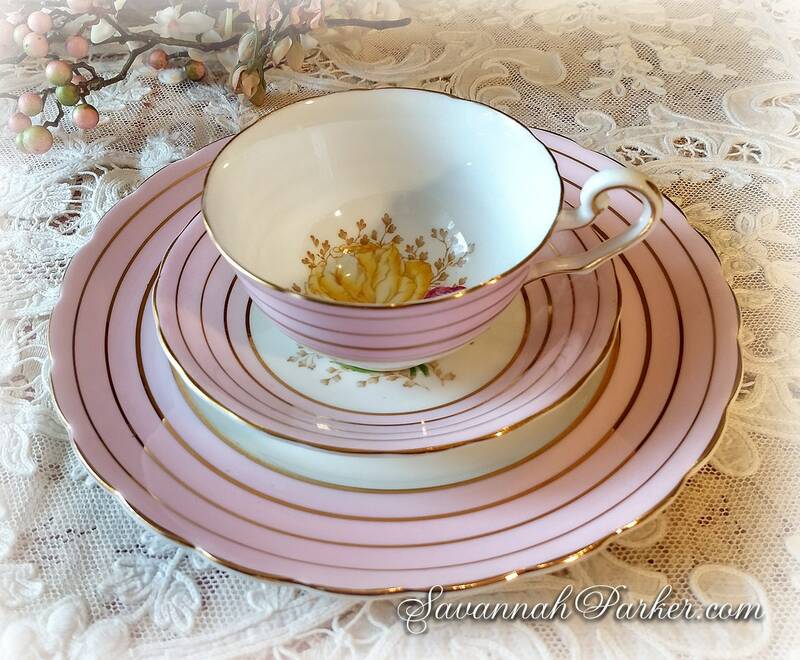 This listing is for the pink tea trio ONLY; photo props, silverware and other items are not included. 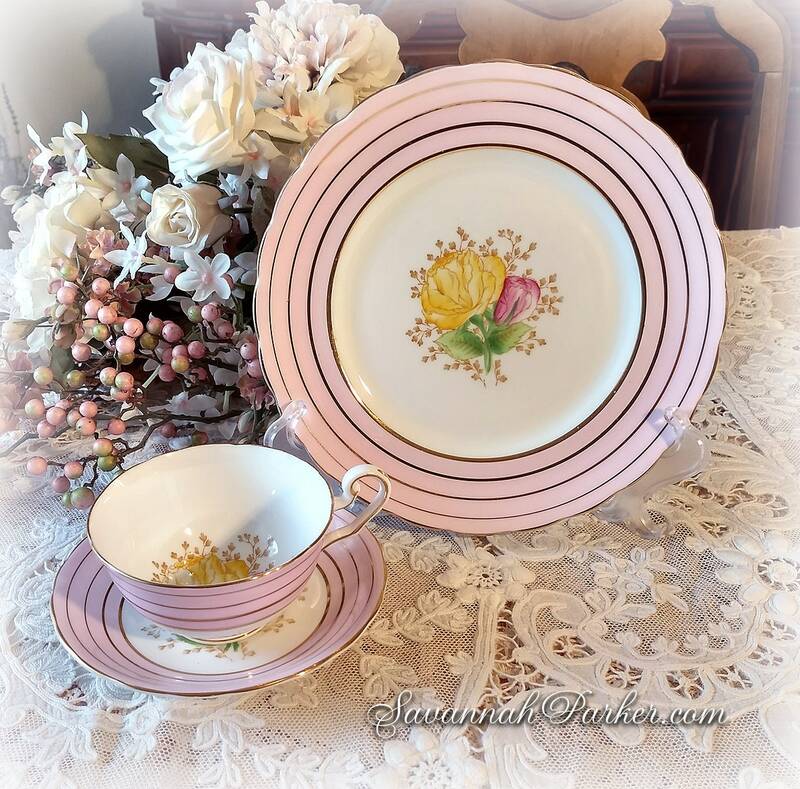 Do check my other listings as well for two other matching Victoria C & E cup and saucer sets in the same pattern but in pale green and pale yellow--they look just gorgeous together with this set! 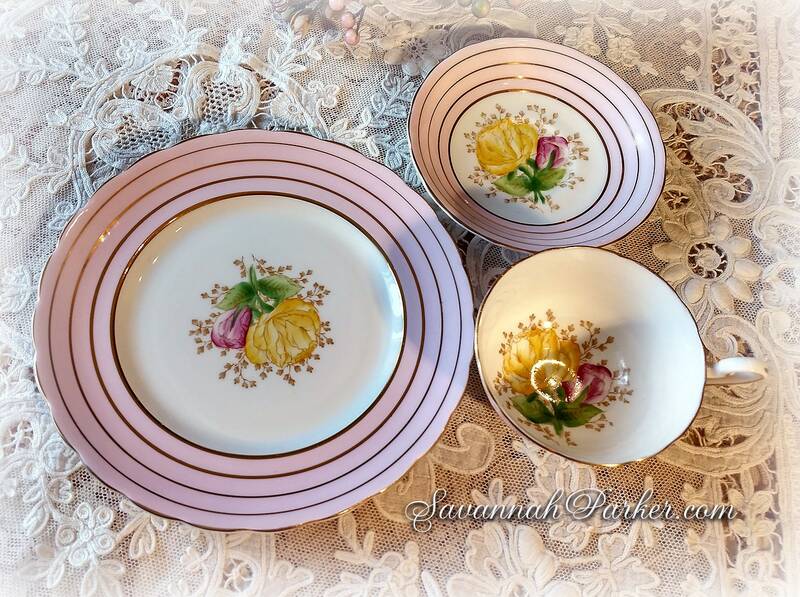 No chips, cracks or any other damages on this beautiful trio, gold trimming is all intact and shiny, doesn't look to have been used. 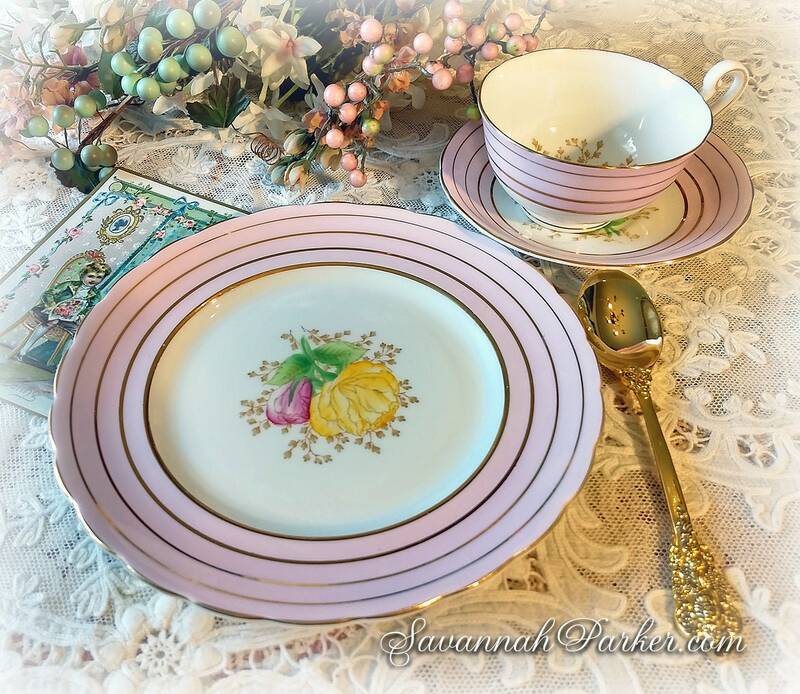 Marked on the bottom Victoria C & E Bone China, England and Hand Painted as well as a few painted markings by the artist who handpainted the center designs. This, as with all my pieces, will be exceptionally well wrapped and packaged in the best shipping materials and sturdy, brand-new boxing---through years of purchasing fine china I know how important it is to package things carefully. Please note that if there is breakage caused in shipping, refunds WILL be given when buyer provides me with photographs of the damage immediately upon receipt of the damaged goods----not several days, or weeks, or months after receipt----since these are vintage items there will be no refunds for other reasons, as I take great care to describe items/issues meticulously and thoroughly; and because they are VINTAGE items with the inherent age qualities of vintage items, I do not guarantee or claim that they are new and as-flawless-as new. I make every effort to scrutinize each piece very carefully, and will always note any flaw or issue within the description.